Honda Alghanim, the exclusive distributor of Honda cars, motorcycles and marine equipment in Kuwait, announced the launch of the All-New 5th Generation CR-V. The completely redesigned and reengineered 2017 CR-V boasts of bold new styling, a more premium interior and a host of new features and technologies aimed at enhancing CR-V’s status as the outright benchmark in the highly popular compact SUV segment. The New CR-V targets the highest levels of quality and driving refinement in its class with top class steering precision, ride comfort, body control and cabin quietness. The New CR-V comes in four grades namely, DX and LX in 2 Wheel Drive (2WD) and EX and Touring in All Wheel Drive (AWD). New Powertrain and Chassis Technology: At the heart of the 2017 CR-V is a 2.4-litre DOHC, direct injected i-VTEC engine that is mated to a smooth shifting and sporty continuously variable transmission (CVT) with Honda G-Shift control logic. The 2.4-liter engine generates 184-horsepower @ 6400rpm and a torque of 244NM @ 3900rpm. The fuel consumption statistics of the CR-V are 15.5km/L for the DX and LX grades and 14.7km/L for the EX and Touring grades. The all-new body and chassis design in the 2017 CR-V provides more agile and confident handling, greater drive refinement and superior overall versatility. Its front MacPherson strut and rear multi-link suspension utilize specially tuned low-friction dampers, with both FWD and AWD models including tubular front and solid rear stabilizer bars that promote quick turn-in and flatter cornering. Dual-pinion, variable ratio Electric Power Steering (EPS) also contributes to the CR-V’s direct and satisfying steering feel. Bold and Sophisticated Exterior Styling: The CR-V heads in a new fresh direction with crisper and sharper front-end design elements such as new aggressively styled headlights surrounded by wing shaped LED Day Time Running Light (DRL) array on all grades. The CR-V’s new windswept frontend appearance also includes signature Honda LED headlights (touring only). Wide muscular fenders with athletic wheel arches, longer wheelbase and short rear overhang give the 2017 CR-V a more sophisticated and athletic presence. 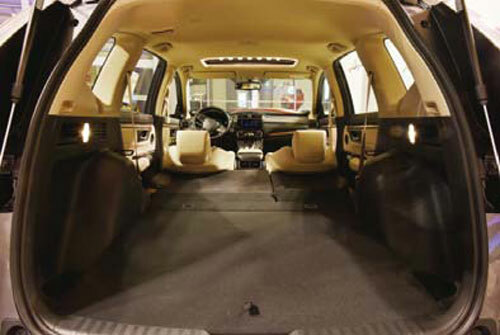 Perfectly straddling the line between bold design and modern sophistication, this is the perfect SUV for any lifestyle. The New CR-V also features distinct LED taillights and exciting wheel options in 17 inches (DX and LX grades) and 18 inches (EX and Touring Grades) that help it stand out whether sitting still or taking off. It also includes a Power Programmable Tailgate, which opens and closes at the push of a button with added tailgate height-adjustability feature (available on Touring grade only) which can be customized for drivers of all heights. Other notable standard features include power door mirrors, side mirror LED indicators, rear fog lights, headlight off timer, various chrome garnishes and auto rain sensing wipers (Touring only). Premium, Spacious and Technologically Advanced Interior Styling: The New CR-V raises the bar for interior refinement and utility through its completely redesigned cockpit and innovative premium features. The more spacious cabin, with top-in-class interior space and the best rear seat legroom in its class, features upgraded materials throughout, including a new softtouch instrument panel and more intricately stitched seats. A color TFT driver information interface (DII) center meter display adds to the handsome new design aesthetic. With the new Easy Fold Down and 60/40 split rear seat design, the CR-V interior is incredibly versatile with room for five people and a substantial amount of cargo of various sizes. The CR-V offers the latest in vehicle connectivity and audio performance with a new generation of advanced technologies. The DX and LX grades have a 5-inch Colour Screen Audio and the EX and Touring grades have a 7-inch touch screen Display Audio interface with Android operating systemTM that now features a physical volume knob as well as an available Navigation system. The 7-inch touch screen Display Audio is compatible with Apple CarPlayT M and AndroidAutoTM platforms, giving customers seamless integration of key smartphone features and functions, including smartphone powered GPS navigation and voice controlled search capabilities. The clean and elegantly laid out dashboard presents advanced driving technology placing essential information directly in the line of sight. The DII supplies a wide range of information such as average fuel consumption, AWD torque identification, turn-by-turn navigation and Driver Attention Monitor. The Driver Attention Monitor is designed to detect driver fatigue and alert the driver when exhibiting diminished attention to the road with a series of visual and audio alerts. The Honda LANEWATCHTM feature in EX and Touring grades, uses a camera located in the passenger door mirror to display a clear image of the lanes and any vehicles that are on the lane on the 7-inch Display Audio screen. The Multi Angle Rearview Camera with dynamic guidelines shows steering input direction, to ensure you park safely and quickly. Some of the key comfort and convenience features available on the New CR-V include a smart entry and remote engine start (LX, EX and Touring only), single zone air conditioning in DX and dual-zone climate controls in the remaining grades, rear A/C ducts in all grades, Auto Dimming Rear View Mirror (EX and Touring only), Electronic Parking Brake (EPB) with Brake Hold function, front USB ports, rear 2.5A USB charging ports and front passenger seat with 4-way power adjustment and driver’s seat with 8- way power adjustment and 4-way power lumbar support. Advanced Safety: The all-new 2017 CR-V utilizes Honda’s next-generation Advanced Compatibility Engineering™ (ACE™) body structure. 2017 CR-V targets the highest available collision safety ratings, including an NCAP 5-star Overall Vehicle Score from the National Highway Traffic Safety Administration (NHTSA) and a TOP SAFETY PICK+ rating from the Insurance Institute for Highway Safety (IIHS). The 2017 CR-V utilizes an Electronic Brake Booster (EBB), which replaces the conventional vacuum Brake Booster. The EBB motor is controlled by a microprocessor that monitors the vehicle speed as well as the pressure the driver applies to the brake pedal, building superior hydraulic pressure more quickly and with less pedal effort in all braking situations. Other Honda active-safety features such as Vehicle Stability Assist (VSA) with Traction Control Systems (TCS), Anti-Lock Brake Systems (ABS), Electronic Brake Distributor (EBD), Agile Handling Assist, Tire Pressure Monitor System(TPMS), Brake Over Ride System and Hill Start Assist (HSA). Rear Parking Sensors are present in LX, EX and Touring grades. Honda Alghanim invites all its customers and enthusiasts to visit one of the two Honda Alghanim showrooms located in AlRai and Shuwaikh to discover the all-new 2017 CR-V. The Ramadan timings for the showrooms are as follows: Honda Alghanim showroom in Al-Rai area operates from 9:30 AM to 4:00 PM and from 8:00 PM until midnight, Saturday to Friday. Shuwaikh showroom operates from 9:30 AM to 4:00 PM and from 8:00 until midnight from Saturday to Thursday. The cars service center waiting lounge offers entertainment and comfort for customers, digital satellite TV, free wireless internet and relaxing massage chairs. The service center operates from Saturday to Wednesday from 7:30 AM to 8:30 PM, from 7:30 AM to 6:30 PM on Thursdays, and from 2:00 PM to 7:00 PM on Fridays.